The Homemade Haven is a cute Etsy shop with lots of gorgeous goodies made by the lovely Zoe. There's lots of floral and decoupage which is absolutely gorgeous. I am literally in love with her shop. All her prints are cute - there's chevron, polka dots and beautiful florals! Zoe makes magnetic wooden pegs that have been decoupaged and made to look pretty. They are perfect for pinning things to the fridge - they're so gorgeous. Zoe sent me two designs to review and they're both beautiful floral ones. 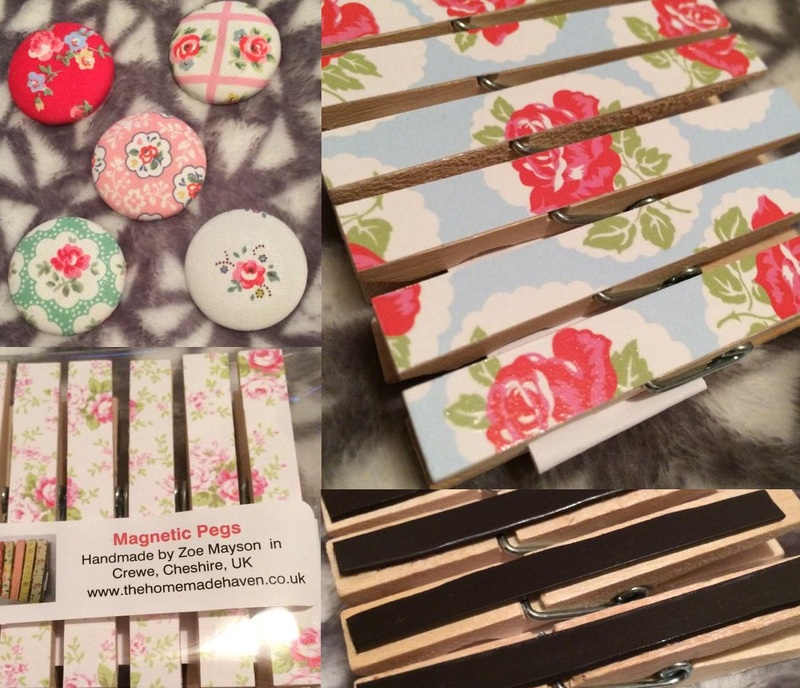 The decoupage is very professional looking and the magnets are secured safely on to the back of the pegs. They are absolutely gorgeous and will actually motivate me to make a shopping list and stick it to the fridge. I also received some lovely fabric covered button magnets. They have been attached to strong magnets with industrial strength glue. The fabrics are beautiful floral designs - I'm so ridiculously pleased with them. Seriously, you should all check out Zoe's shop - everything is precious. I've linked it at the top of this post so go ahead and check out her cute home accessories!